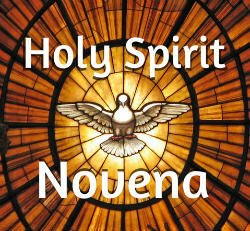 Here’s Day 6 of the Pentecost Novena to the Holy Spirit! I thank God for the gift of pregnancy which I have longed for.I pray for a healing, a healthy pregnancy and successful birth through Christ our Lord. By your grace,miracles are performed in Jesus’name.May we learn to grow our faith every day.Give us the grace to be faithful to you as you are to us. Bowing down in the power and grandeur of the holy spirit. PLEASE PRAY FOR ALAN AND ME. I PRAY HE WILL CONTACT ME SO WE COULD HAVE ONE MORE CHANCE AT RECONCILING THINGS. THANK YOU SO MUCH. IN JESUS’ NAME ???? Holy Spirit bless my family and restore my marriage. Convert the heart of all my family and baptize all of us with your seven gifts???????????????????????????? Please go into Alan’s mind, heart and soul and let him have a change of heart regarding the things he said to me and the way we left off. Please let him contact me so we can talk. It hurts me so much to leave off so badly. I pray for God’s will to be done for us. I hope and pray that he will contact me so that I know he cares and loves me like he said he did. I want to know that what we had was different and special. Please dear Holy Spirit, please hear and answer my prayer, and please give me the strength to accept God’s will. In Jesus’ name. Holy Spirit fill my husband. Let him hunger and thirst for the word. Holy Spirit protect him from the enemy’s clutches. Open his eyes and heart I pray. Please pray for the restoration of my marriage and my family. I claim victory over Satan! I am praying for my boyfriend’s working visa/status, our relationship and my work. I also pray for my mom and her happiness. I lift up my family that they may always be healthy and contented. World peace. I am praying for an outpouring of the Holy Spirit on myself and my family, most especially my husband. Most Holy Spirit,the blessed Trinity ,all the Angles & Saints please hear these prayers. Please intercede for my husband & myself for Graces that will give us peace of mind and patients. Calm down any anxieties that comes up with my husband. Guide me to get the help my husband need to achieve less stress in his life. Come Holy Spirit fill the hearts of your faithful. Praying for all people suffering & affected from terrorism. Praying for world Peace throughput the world. Peace in all families, at work, in all countries throughout the world. Praying for my friends, Betty ‘ s Father ( Joseph ) who’s involved in the occult, her sister, Roma has done ungodly things towards her and the family. Pray for Roma’s son who was punished when a child by burning his hand on the stove whenever he stole a candy. I put a cross between Roma and her children. Praying for Betty:& her husband , her brother and all family members to seek Devine Guidance from a Priest! I ask this in Jesus Holy name. Amen ???? ???? ???? ???? ???? ???? That my children become faithful to Jesus. For loving spouses for my children. To sell our home. To help with my anxiety. I pray for clarification for the next step that The Lord wants us to take. Husband has two job opportunities and one was just been officially offered, but the other is better for us and pays more closely to his pay now. It also has better job security but has not officially been offered as of yet. Lord, please make it clear to us what is the best next step. Please lord send my three sons Ryan Timothy and Neil on a path to know you Jesus of Nazareth better. And that they become successful in life in all ways that you see are beneficial to their wellbeing. Heavenly father I pray for financial blessings. I pray for financial deliverance. I pray for money to finance my son’s tuition. His desire is to become a medical doctor. I pray that my daughter be successful with her exams. Help her and guide her.,Thank you jesus. I pray that my child r n will keep forcus. I also pray that my family and myself will be faithful on this earth. For my sister and niece to has a successful interview today. Thank you Lord. Please,Lord, help the Pittsburgh Penguins hockey team win the Stanley Cup this year 2017 by winning 3 more games versus the Nashville Predators hockey team. Please help Steph and her family at this sad time. Help my agrophobia. In the name of the father.